A landing party under the command of Captain Kirk encounters Lazarus, an embattled and desperate man who begs assistance in his defense against an enemy who claims to be insane. When Kirk is reluctant, Lazarus makes an incredible claim of being the only man who can prevent the impending total destruction of civilization. 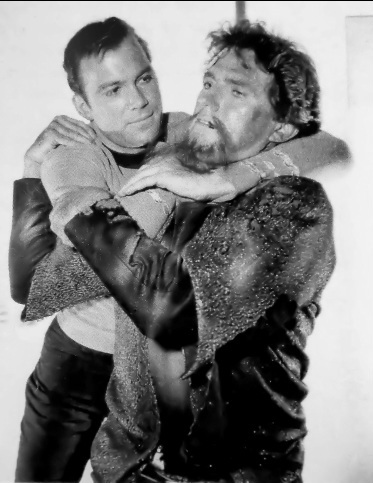 Like many TOS episodes, “Alternative Factor” deals with the recurring theme of how the needs of many outweigh the needs of the few…or the one. This episode suffered tremendously from Roddenberry’s socially conscious bravery squelched by network squeamishness plus actor problems. The result was a messy episode with continuity problems and sub-par storytelling. The episode originally contained a passionate love affair between charismatic villain Lazarus and female member of the ship’s crew. The producing team hired black actress Janet MacLachlan to play opposite (white) John Drew Barrymore. If played out as designed, it would be one of the first interracial romances on television (keep in mind that the controversial film Guess Who’s Coming to Dinner wouldn’t hit movie screens for almost a year after this episode was produced). While NBC was too politically sensitive to attack this issue directly, they slowly pulled apart the romantic tension of the episode, causing script problems and last minute changes. The producer’s hands were tied – they could shoot the episode as written and risk NBC’s deciding not to air the episode, which would cost Desilu the entire production cost. Once the newly neutered script was delivered, John Drew Barrymore (of the famed Barrymore acting family), set to play Lazarus, withdrew from the role the night before the episode was scheduled to begin production. The producers convinced actor Robert Brown to take on the role without a moment of rehearsal or prep, resulting in some hastily staged scenes. In honor of its broadcast anniversary, watch the original episode (try amazon.com, Netflix or hulu plus) in a whole new way by first reading all of the great behind-the-scenes details in Marc Cushman’s These are the Voyages: TOS, Season One. Get your copy today!